Something worrying is happening in politics. While we’ve seen many inspired by the shift in Labour’s direction, there is a growing distrust in politics more widely. A feeling of separation and distance that is borne out by the policies we see coming from Parliament. As we’ve seen in the US, these sentiments will be ignored at our peril. But the union movement – with roots in thousands of workplaces and across all sectors – is a link between the workplace and Westminster. That gives us a historic opportunity amid the 150th anniversary of the TUC to work out how to help bridge that gap. The latest Hansard Audit of Political Engagement found a drop in those ‘satisfied with the system of governing’ – yet a rise in political interest. That could go one of two ways: it could fuel the nasty, divisive politics of hate we see in the far-right, or it could be put towards demanding a much-needed overhaul of Westminster. That needs to start now. The Tories recently held the first ‘National Democracy Week’. It was an Orwellian celebration, given the party’s attempts to pack the Lords with yet more unelected politicians, and plans to force voters to show ID at the polling station (as we’ve seen with the Windrush generation, we know it’s not Tory voters who will lose out on that one). And the 2017 General Election showed that yet again Westminster’s First Past the Post system is a big part of the problem. One in five people felt forced to vote tactically. 68% of votes had no impact on the result. And the system exaggerates divisions – Labour secured 29% of the vote in the South East but got just 10% of seats. There’s a real chance Labour could actually win more votes than the Tories – but get fewer in seats, a ‘wrong winner’ result. It creates other bizarre results – handing power to small parties like the DUP while leaving millions of others unrepresented. The Electoral Reform Society calculate that Labour would have been the largest party under the proportional Single Transferable Vote system (used in Scottish local elections and across Ireland). Yet under the current system we could witness a ‘wrong winner’ result: Labour getting more votes than the Tories, but fewer seats. Every new democratic institution created in the past two decades has rejected Westminster’s centralised, broken model. Voters in Wales, Scotland, Northern Ireland and Greater London (and, indeed, in most modern democracies) are all used to more proportional systems – seeing their voices properly and fairly reflected in the corridors of power. And they’re used to a more ‘consensual’ form of government: one that is local, devolved, and less antagonistic that the bitterness we see in the so-called ‘Mother of all Parliaments’. Whether it’s scrapping the private members’ club that is the House of Lords or giving voters real power at the ballot box, reform is long overdue: we need a new democratic system for a stronger society. Only with political equality can we stem the tide of pernicious rage that is growing in Britain and which could turn dark. The right know how to capitalise on this fear – our solution as a movement must be radical, grassroots, and empowering. 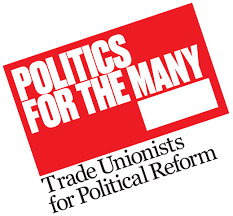 Unions have been at the forefront of progressive political change – now we can lead a new frontier for secure lasting change: a Chartism for the 21st century.